If the price of bread matters, then you might not want to live in Seoul where it will cost you a whopping $12.44 for a kg loaf of white bread. Where are we going? To what prices say about a city. We should start by noting that the surveys differ. The data used by WSJ indicate that NYC, then Hong Kong and London are the world’s most expensive cities to live in. 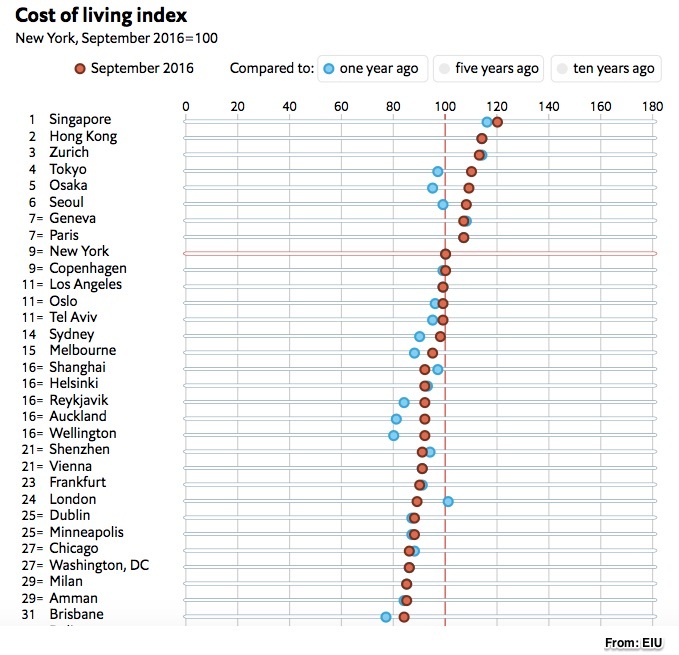 However, the Economist’s Intelligence Unit places Singapore at the top with London way down at 24. Below you can see more of what the EIU decided. Their index was based on the prices of 160 goods and services. If I had copied their entire graphic, you would have seen Mumbai and Bangalore, at 127 and 131, close to the bottom. EIU also let us know that Seoul has the most expensive groceries while Singapore’s ground transportation costs are sky high. In Singapore also, you will pay more for clothing and utilities. Meanwhile entertainment and recreation will cost you the most in Zurich and Geneva. We can look at the cost of living from so many different angles. Deciding why a city is expensive can take us to currency fluctuation. Places with stronger currencies tend to be pricier. We can also look at commodities like oil. Cheaper oil can depress prices as goods become cheaper. Also though, with their extra discretionary income, consumers can push prices up elsewhere. Most crucially though, the cost of living is about the people who live in a city. According to a recent WSJ article, the cost of living in the U.S. is affecting where we live. Lower income, less educated families are leaving pricier metro areas. Hypothesizing that affordability was the reason, WSJ explained why people were leaving New York and California. All of this leaves us with how a city’s cost of living is all about the large macroeconomic influences that shape the small details in our daily lives. My sources and more: If you want to compare the price of bread in Paris and N.Y.C, the Economist Intelligence Unit has the numbers and much more about the cost of living. For a second perspective, WSJ looked at migration patterns and also ranked cities differently.